Create, update and share competitive battle cards in real-time. Imagine product and sales collaborating to gather & share intelligence that sidelines any competitor. Stop wasting hours looking for competitor updates manually to upkeep battle card spreadsheets. Instead, use Kompyte’s automated tracking features to speed up battle card creation. Share your battle cards automatically and use Kompyte’s extension to make them accessible at anytime with 1 click. Benchmarks, features, pricing, kill points and anything they need to win a deal at a click! Get your reps to overcome any objection with real-time intel and boost their performance. 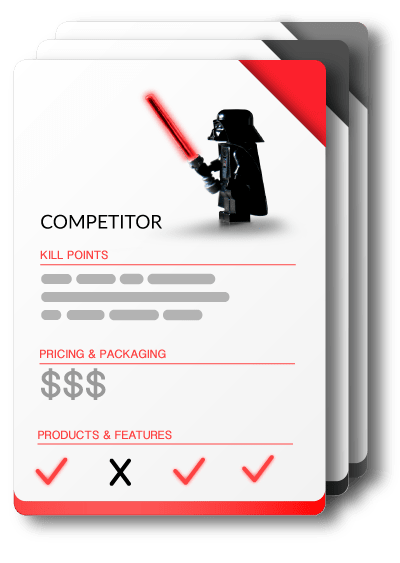 Create battle cards to use when selling against competitor. What are 3 bullets you know will win you any deal against a competitor? Write them down and make them accessible to any rep or team member. What makes your product unique? What is the feature that makes the difference? Show your reps how to effectively pitch your solution and win more deals. Pricing, plans & option comparisons. Help your team explain why your pricing works better than your competitors’. Anything that will help your sales and marketing teams win more deals, add it to your battle card. Create any battle card in a few minutes with our simple and intuitive designer. Kompyte’s battle cards are 100% customizable with multiple field types to compare different traits. Share and make battle cards accessible at anytime with our battle cards browser extensions for Chrome and Firefox. 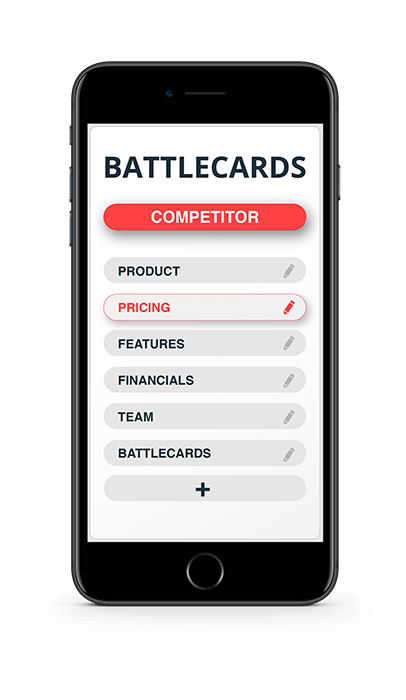 A battle card designer integrated in Kompyte’s real-time competitor tracking solution so that you can update them within the same tracking platform. Invite your team members across departments (Product, Marketing and Sales) to leverage the power of your battle cards and collaborate with insights and feedback. With Kompyte Intelligence in Salesforce, you give your sellers instant access to the knowledge they need to close competitive deals. The integration embeds a view of available reports on every opportunity for easy access to your kill points. Based on permissions, sellers can edit battlecards directly in Salesforce or provide feedback to improve battlecards overtime.